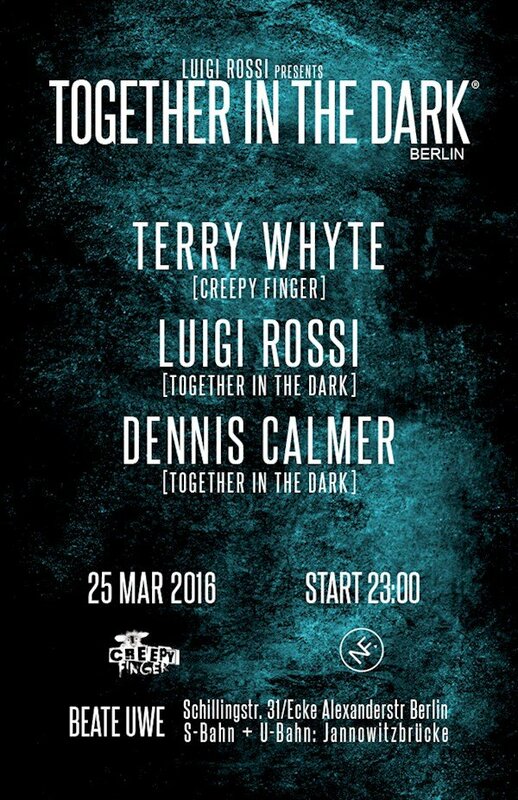 This event "Together in the Dark: Terry Whyte, Luigi Rossi & Dennis Calmer" @ Beate Uwe has already ended on 03/25/2016. Here you can find upcoming events for this location! Next Friday, at Beate Uwe, Together in the dark gets ready to receive the artist in charge of Creepy Finger: Scottish DJ Terry Whyte. He will join our residents and captains of techno Luigi Rossi and Dennis Calmer. Terry Whyte is a DJ and producer with a profound understanding of the intricacies of sound technology, as well as what makes a club full of ardent techno fans tick. His own imprint Creepy Finger Recordings was launched in 2012 with Nino Blink. Terry has also had releases on Der Hut, Krad Records and recently collaborated with the Hamburg-based label Moin Moin. Also on the bill, Luigi Rossi has a true passion for music and an immense love for club music and djing. He moved to Berlin in 2012, opening a new chapter in his music career. Here, he created the concept of Together in the Dark, which is hosted every week on a range of websites as a radio show and in clubs throughout Europe as a tour event. The show has already been hosted in countries like Russia, Hungary, Spain and Germany, to name a few. Rounding out the lineup is Dennis Calmer, the other mind behind Together in the Dark, who moved to Berlin in 2013. The city has changed his whole musical perspective, transforming Calmer into a more versatile minimalist DJ and record lover. The latest edition of Together in the Dark promises to get you dancing with top-notch record selection from three emerging names in techno. The location this time around will be Beate Uwe, a central club in Berlin. The venue offers the ideal atmosphere for you to take in the concept and the philosophy of this unique party.